The update to SkrewCommon and vWallpaper gives vWallpaper some nice new features. When you select Video Ringtones you will notice that the Select Video option has been changed to Select Global Video and that there is a new Manage Contacts feature. The Select Global Video option still allows you to choose one video ringtone for all incoming calls. A cool new feature is the Manage Contacts feature which allows you to select video ringtones for specific contacts! When you select Manage Contacts, you will get a list of your contacts. You can then choose a contact and it will bring up the list of videos you have downloaded. Just select the video you would like as that contact’s ringtone. You will then be brought back to the contact list. The contact’s with video ringtones assigned to them will have a delete icon next to them. To delete a video ringtone, tap the icon and then select Delete. It will only delete the video ringtone and not the actual contact. Another very nice new feature is when you select a video to assign it to a contact or as the global video, you will get to see a preview of the video. An excellent feature! The update also allows you to use videos from MxTube as a video ringtone. The only feature I would love to see now is the ability to view the videos before I download them. That way I do not have to download them and then delete them…it would save a ton of time. 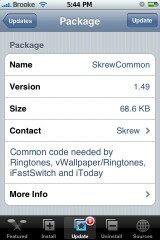 You can get both vWallpaper and SkrewCommon through the Skrew source. much better. I love this much better than videostone now. I downloaded the newest SkrewCommon and vWallpaper (with video ringtone), but vWallpaper doesn’t work. Anybody has the same situation? or does anyone know what’s wrong? You need to turn both wallpapers off in the summer board. Try that. This app keeps getting better, I just moved my videos from VIDEOSTONE to this one, now I like this one better too. Is it now possible to adjust the volume of the ringtone? OK, I uninstalled and reinstalled both vWallpaper and SkrewCommon and it worked!! When I launch vWallpaper and then just on the first screen…after fully loading…I scroll down…It closes the App. anyone else having this issue? It works…so I think I like this better than VideoTones as well….will be using this one for now. just one lil’ problem when I’m using the phone on a call and a new call come in I can hear the video on my bluetooth so I’m talking and listening to the video at the same time I have to push volume so the music stops, anybody with the same problem. Is the startup screen for 0.93 supposed to say dev frenchiphone.com ??? 0.92 worked for me but 0.93 does not….how can i get 0.92 back? My iphone is 1.1.2. I’ve installed the vwallpaper v0.93, but when I ran it, it just gave me the first Logo screen, then back to the springboard. It can’t work. But v0.92 can run correctly. Does anybody knows the reason or the solution? Thanks. unfortunately I don’t have it. I’m still looking for it(0.92) now. vWallpaper 0.93 working fine but when i download video tones it completes to 100% but no video saved in iphone. Is it a bug? I have some problems here. When i change my Sim and reset my iphone then i turn it on. It hangs on the apple logo and hangs there o.O!! Then i do a hard reset ( home + reset buttons ) and it takes about 20secs to turn on the phone. Then vwallpaper doesn’t work anymore. I enabled it the reset my springboard but nothing happen. Is anyone else having issues finding vWallpaper. I went on installer, put in i.danstaface.net and it still won’t pop up. What am I doing wrong? Is there any other place where I can get vWallpaper? how do i downloaded…. i’ve been trying all day pleasee helpp!!! please some one tell me how to download it!!! I’m having a problem with assigning a ringtone to contacts. I press ‘manage contacts’ and assign a video to it. 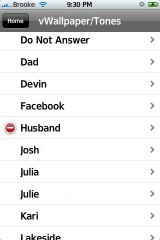 It assigns and goes back to the contact list. When I press a different contact and assign it a different vringtone it assigns it and returns to the contacts screen. I then go back into the first contact I assigned a tone to and it’s the same one as the last one I assigned. In other words, I seem to only be able to assign one ringtone to contacts. Anyone else with this problem? Anyone with a solution? Thanks! I have the same problem exept that when i add a video to a contact the program just shuts down and no video is assigned. When I choose manage contacts and press the edit button the same thing happends, it shuts down. I have the jailbreaked Iphone 4.1. I uninstalled Winterboard but it didn’t help. any solution? i am on 4.1 3gs video tones works but i cant edit my manage contacts tones.. eveytime when i try to do edit it crashes.. need help..